Develop a support program to encourage newly-licensed Hams so they don't fall off. Call it "Elmering," call it "Mentoring," call it what you like. New Hams need help to keep them growing into their new hobby. Preferred Bands and Modes: SSB on 80, 40 and 20 meters, FM on 2 meters. In 1962, I earned a Novice-class license (WV6ZHL) at age 11, making me the second-youngest US ham radio operator at that time (see newspaper article, Aug 02, 1962, Mountain Democrat and Placerville Times). Novice-class was originally the first of four licenses available back then. A few months later, I earned a Technician-class license. 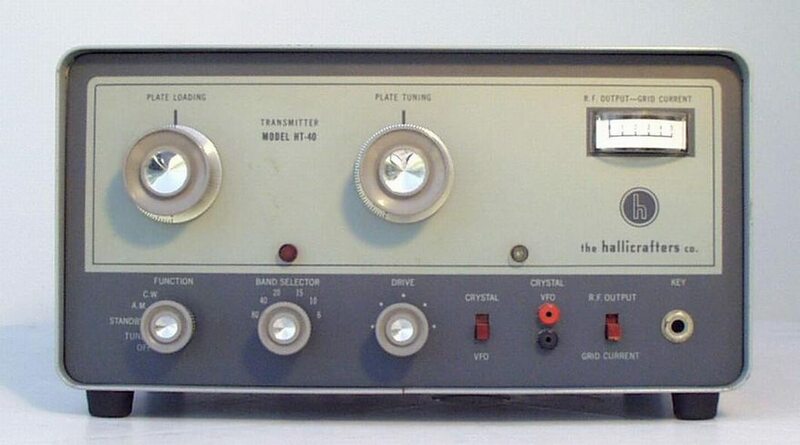 Early Gear My first radio was a Hallicrafters SX-71 and an HT-40 Transmitter. that my parents scraped together enough money to buy for me (Thanks, forever, Mom and Dad). My antenna was a dipole I had strung along the edge of my parent's house, and just twisted the connections onto the end of a piece of 50-ohm coax - no matching, no baluns, no nothing. I had also put up a random long wire. Again, no matching (didn't know what that was). Fortunately, my transmitter was vacuum-tube based and low enough wattage that I didn't burn anything up! Mis-spent Youth A few months later, I upgraded my license to Technician-class, which changed my call sign to WA6ZHL. I always wanted to earn a higher license class. But before I could master the 13 to 20 wpm code speed and electronics skills required for a General or Advanced-class license, I entered into a different group of classes at my local High School and became more interested in cars and girls than radios. I quickly lost interest in Ham Radio altogether and let my license lapse. 55 years later, after a career spent in high tech and satellite communications, I found myself wanting to renew my Ham Radio hobby and earn my license all over again. Only this time around, I'd promised myself I'd go straight to the top and pass all three exams at once. Why Ham Radio?!? When I announced I was going for my license, friends and family asked, "Why Ham Radio when you already have instant, world-wide communications using Email, SKYPE, Twitter, Facebook, and text messages?" For me, apart from the sheer fun of building my own radio station from scratch and talking with fellow Hams all over the world, I'm really interested in learning about how to participate in providing local communications services through emergency-response groups like ARES, CERT and RACES. The 2017 and 2018 weather and fire disasters in Texas, Florida, Puerto Rico and California once again proved the value of Ham Radio operators who provided life-saving, local emergency radio communications when power, cell phone towers, and Internet connections were cut. Now that I've regained my license, my dream is to outfit a complete mobile communications rig so I might be able to help some day when Ham Radio operators are called again to assist in another emergency. Checking Back In One of my first steps to get back into Ham Radio, even before I got a license, was to join our local Clubs; (El Dorado County Amateur Radio Club) and the (Sierra Foothills Amateur Radio Club) where I could meet other local Hams, and start spinning up on current radio technology. This was one of the most important moves I made. I've met a lot of great people who generously offered advice and assistance to a 'wannabe' Ham. I think it's absolutely vital for anyone thinking about becoming a Ham to connect with their local Amateur Radio Clubs first. My advice is to attend some club meetings in your area, and see if it works for you before you make an investment in hardware. Here, you'll find a welcoming group of fellow enthusiasts who are more than willing to share what they know, and answer questions you hadn't yet thought to ask. The Sierra Foothills Amateur Radio Club even offers a twice-per-month Elmering Net on one of our local 2 Meter Repeaters. How cool is that? Test Day Even though I could have grandfathered in on my former Technician's license and skipped the Technician and General tests altogether, I wanted to make sure I had relearned the fundamentals. After two months of online study at eHam.com and HamStudy.org, I felt I was ready to pass the exams. A twice-yearly exam session, sponsored by the Rubicon Trail Foundation, was held on Saturday, December 2nd, 2017, in El Dorado Hills, CA. I passed all three Exams on the same day, and earned my Extra-class ticket. Now I was ready to get back on the air, and on Cloud 9! <<< Thank You, VEs! My sincere appreciation for the VEs who generously donated their time, and then stuck around in an otherwise empty room while I pondered my answers. Special appreciation for VEs Stephen Porten (KN6OX), Gordon Fuller (WB6OVH), Merv De Haas (WA6LYE), and Barbara Olson-Arenz (N6BOA). Two weeks later on December 14, 2017, Barbara informed me that I had been granted my new call sign, AJ6AR (it just so happens my first two initials are "AR.". How's that for a Vanity Call Sign right out of the gate?). Rip Van Winkle Wakes Up - Yikes!!! So much has changed in radio during the 55 years since I was last on the air. Now, we have communications satellites, computers, the Internet, smart phones, Google, LED lights, and WiFi everything. Back in the '60s, all my gear used vacuum tubes. Now, radios are all like miniature computers. And that's a good thing. The gear is so much better now. And it has to be, because all this new technology around us adds noise right at the same time that HF band propagation is suffering from historically low sunspot activity. In the '60s Hams were surfing on a 400-year high solar cycle, and the bands were so crowded that ops were stepping all over each other trying to find a clear frequency. My first thought getting back on the air was, "Where did everybody go?!?" Bad Air Day What was more startling to me, though, was the many operators having what I like to call a "Bad Air Day." The amount of jamming, bullying, cursing, trolling, and just plain nastiness one now hears on the bands was a shocker. Maybe it's the result of the increased daily stress levels we all face, or our toxic political climate, or maybe it's one of the negative consequences of the Internet where some people have learned they can say or do whatever they want without thought or respect for others. Whatever it is, I hope for the sake of our hobby that it won't get any worse - and may eventually get better. Still Workin' After All These Years... I'm the owner and VSAT Field Engineer for El Dorado Networks (ElDoradoNetworks.com), a satellite TV and Internet service and installation company in Diamond Springs California. I also provide remote residential and commercial VSAT satellite Internet, ARO and TVRO systems consulting, installation and repair services throughout the Western US and Mexico (I learned basic Spanish living in Mexico 4 years). <<< Here's an old key and telegraph sounder mash-up that sits on my office desk as a reminder of my hobby. My wife says now she just needs to figure out how get me back into the office every day, since I'd really rather be home gabbing on my radios. Stop By and say, "Hi!" You can find me mainly on 160, 80, 40 and 20 Meter Sideband most mornings and evenings (Pacific). Also on some of the local 2 Meter Nets in the evenings when possible. 11/24/2018 - W6WN: Applied for and received a new Vanity Call Sign: W6WN. 11/16/2018 - The Camp Fire Disaster Recovery: I was called upon to help in Disaster-recovery efforts after the Camp Fire in Butte County. Working with a team of field engineers from Globecomm, we worked for five days to install eight satellite Internet Backhaul Systems to restore cell-phone service at T-mobile tower sites disabled by the fire in Paradise, Megalia, Quincy and Chester California. I did not have a lot of time for radio but I did have my ICOM 2730 Mobile and my Anytone 868 HT so I could monitor EmComms on local repeaters WD6AXM and W6SCR. W6SCR was especially notable because the Butte County Sheriffâ€™s Communication Reserve made the repeater available to coordinate communications between various Animal Rescue Teams assisting in the area. I've been asked by the Sierra Foothills Amateur Radio Club to present a report on the role that local Amateur Radio played in assisting local emergency and recovery efforts, and especially the impact the disaster might of had directly on the local Ham Radio community. I'd appreciate any additional information, contacts or links you could share concerning the disaster and recovery efforts, and also what might be done to help fellow Ham Radio Operators and others who were directly affected. Please feel free to send an Email to , or call 530 317 8430. 11/01/2018 - DMR Hotspots: Since we don't seem to have a lot of DMR activity on the repeaters in our local area, I had purchased and setup a ZUMspot DMR Hotspot. That has opened up quite a bit of exposure to DMR QSOs through the Internet. 10/19/2018 - PACIFICON 2018: I attended my first PACIFICON Amateur Radio Conference in San Ramon California. On Saturday, I attended the Ham Instructor Academy, Taught by "Gordo," Gordon West, WB6NOA, owner and instructor of the Gordon West Radio School. I was very impressed by Gordo's presentation, and especially enjoyed watching him set a pickle on fire using Morse Code :) His presentation helped me to crystalize one of my Ham Radio Goals, which is to get involved in training new Hams to pass their license exam. It also reminded me that studying for and passing the license exam should be just the beginning, and not the end, of an ongoing process to encourage and promote new Hams. Too often, newly-licensed Hams are left to fend for themselves, and no one offers help to get them to the next stages of their new hobby. On Sunday, I also attended the STEM -Science, Technology, Engineering, and Math Workshop, led by Darryl Paule, KI6MSP. Darryl detailed how he started a STEM workshop with schools in his local area. His presentation helped me to crystalize another one of my Ham Radio Goals, which is to get involved in or initiate local STEM Programs to help foster and encourage the next crop of engineers, using Amateur Radio as one tool of many. 07/20/2018 - NVCON 2018: I attended my first Nevada State Convention (NVCON 2018) at Boomtown Nevada, near Reno. Here, I attended presentations on DMR Radios, taught by Anthony Marcin, W7XM . I went right out and bought an Anytone 868 DMR HT radio. I needed a dual-band HT, and I also wanted to learn more about DMR, so the 868 fit the bill nicely. 06/21/2018 - My First Field Day: Got a chance to experience my first ARRL Field Day, joining up with The Sierra Foothills Amateur Radio Club at Nyack Road, off Highway 80 in Placer County. While there, I had the honor of being invited by the Club to present a demo of remote radio operation without a radio or antenna on premises, and assuming there was no local cell signal or internet, and no utility or generator power available. To do this, I installed a portable HughesNet Gen5 Satellite Internet system and my laptop computer with USB headset and RC-28 control. The system was powered by 300 watts in solar panels, with two marine batteries, and a 200 watt DC to AC inverter (sorry, not able to do pure DC to DC yet). Through the satellite Internet connection, I could connect my laptop from our Field Day camp in Nyack to my 7300 in Placerville. This setup allowed me to remotely control the radio, transmit and receive from 80 miles away. Actually, 90,000 miles away if you include the two round trips to and from the satellite! The added 600 ~ 800 Ms latency over satellite presented some real challenges. At first, SSB transmissions were breaking up and cutting out making them mostly unintelligible. But I was able to adjust the RS BA1 pre-buffer control to 1,000 Ms and that seemed to help quite a bit. Also, I should add that SSB operation still had quite a bit of delay and the audio quality was low. This would take more time to troubleshoot and correct than I had available. I also did not have the time to test Digital modes or CW but they would probably be much more stable modes to use over a satellite connection than SSB. 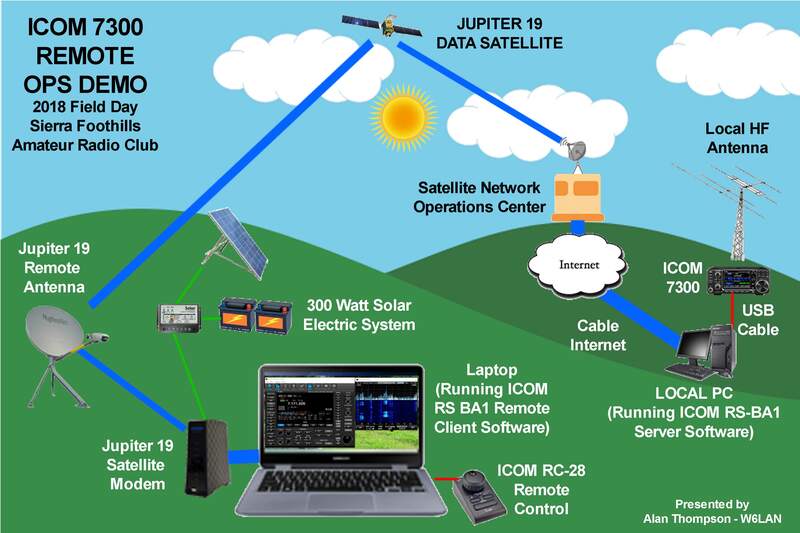 This was basically a "proof of concept" demo, confirming that a 7300 could be remotely operated from anywhere in the US with satellite Internet coverage and a solar power source. There is certainly a lot more testing and fine tuning to be done. 04/25/2018: I had put up a multi-band 520' horizontal wire loop with 50' of 450-ohm ladder line fed from an SGC 200 balanced-line tuner back in March. This has quickly become my favorite antenna for working multi-band HF. Not only was it cheap to build, but I've since made my first international contacts working into New Zealand, New Caledonia and the Ukraine on 20 meters SSB on this loop. 02/26/2018: The Mountain Democrat ran an updated story about me regaining my license after 55 years: mtdemocrat.com/news/alan-thompson-is-still-a-ham/. 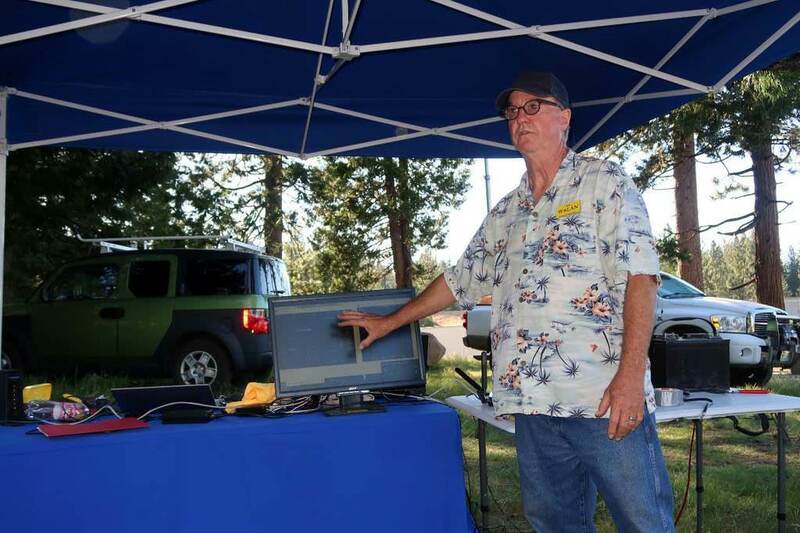 I was pleased the reporter highlighted our local El Dorado County Amateur Radio Club (EDCARC.net). Hoping that might generate more local interest in Ham Radio. 01/17/2018: After three weeks of not being able to get either of my two new radios working, Bob Hess, W1RH, helped me isolate the problem. My 2730 could transmit so people could hear me on two-meter simplex but it would not transmit repeater tones. Bob confirmed that the 2730's settings "seemed correct." He suggested hooking up a car battery and shutting off the house main power to try and isolate RFI issues. Further, my 7300 had started shutting down whenever I'd key the transmitter. That's when I began to suspect there was something wrong with the power supply. I tried adjusting the 7300's TX power down from 100 watts to 25 watts, and the radio stayed on when I keyed the mic. But when I bumped the power to 50 watts, the 7300 shut down again and now it would not come on at all. Turned out that the Powerwerx switching power supply had its input voltage switch set to midway between 120 and 240 volts, and that had been at the heart of all the problems I've been running into with noise and gain. Set the switch to 120 volts and, voila, everything started working.